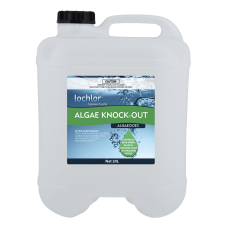 Originally developed for ALL types of algae, Lo-Chlor Algae Knock-Out is now widely known as the No.1 treatment for stubborn algae strains in pebble pools and ageing pool surfaces. Use in all types of pools. Effective against blue-green, black spot and mustard algae. A favourite for pebble surfaces and ageing pool surfaces. Especially popular with salt chlorinated pool and ionised pools. Quaternary ammonium base - dual action formulation. As well as lysing the algae cells, the increased detergent action (foaming) assists in releasing the clinging algae crusts from pool surface. Advise pool owner that product may foam and smell for up to 10 days. Reduce pH to 7.2 for best results. Use with Starver® Pool Maintenance for badly infested pools. Note: High doses of quaternary ammonium compound may combine with free chlorine, resulting in excess levels of combined chlorine. This phenomenon lasts 2 or 3 days. Addition of Lo-Chlor Aqua-Boost is recommended if condition persists. When added to a pool running with a salt chlorinator the ammonia occasionally reacts with the gases produced in the salt chlorinator cell causing fine bubbles to form on the surface of the pool. These bubbles will dissipate as soon as the chlorinator is switched off and usually only last 5-7 days. (50PA20L): LO-CHLOR POOL ALGAECIDE 20LITRE The No.1 Formulation For LONG TERM ALGAE PREVENTION ..